Do I Need a 401(k) Audit? An annual Audit is required to be performed by a qualified Third Party CPA firm when certain conditions are met, primarily when total eligible participants reach 100 and the plan is deemed a "large" plan. Active participants - those individuals currently employed with the plan sponsor and who are covered under the plan and are receiving credited service. An active participant would include those employees who have elected to participate in the Plan as well as those who are eligible to participate but, have elected not to defer. If the Plan qualifies as a Large Plan, it must file Schedule H of form 5500 and have the Plan audited by a qualified independent public accountant. If the Plan has under 100 participants at the beginning of the Plan year, it will file Form 5500-SF (Short Form) and forego the required audit. If the Plan is a new Plan, then you must determine the number of participants as of the first day participants were eligible to participate in the Plan. Short Plan Year - If the Plan would qualify as a large Plan and its Plan year is seven months or less, the Plan sponsor may elect to defer the audit requirement to the following Plan year. In the subsequent year, if the Plan qualifies as a small Plan, the Plan sponsor will nevertheless be required to have the Plan audited for the short Plan year. The 80 to 120 Participant Rule -If the number of participants reported in Part II, line 6, of Form 5500 is between 80 and 120 and a Form 5500 was filed in the prior year, the filer may elect to complete the current year's Form 5500 in the same category (large or small Plan) as was filed in the previous year. For example, if the number of participants at the beginning of the Plan year is 110, and a Form 5500 was filed in the previous year as a small Plan, the filer may elect to continue to file the short form and forego the audit requirement. However, if the participant count is 121, then regardless of what category of Plan was filed in the previous year, the current year's form 5500 must include Schedule H and the Plan must be audited. How do you tell if you have over 100 eligible participants? Check your 401(k) Form 5500 as filed. 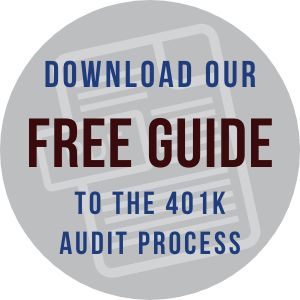 If the total number of eligible participants at year-end are over 100, your 401(k) Plan is required to have an independent CPA Firm audit for this year. If you start at less than 80 you do not need an audit until you have 120 participants.